StormFest 2017 HUGE UPDATE ANNOUNCED! | Badass Concert | Heavy Metal Music News | So METAL, we piss RUST! Home News StormFest 2017 HUGE UPDATE ANNOUNCED! StormFest 2017 HUGE UPDATE ANNOUNCED! It’s official, Uncle Tripp has announced the complete StormFest 2017 lineup, but that’s not all. 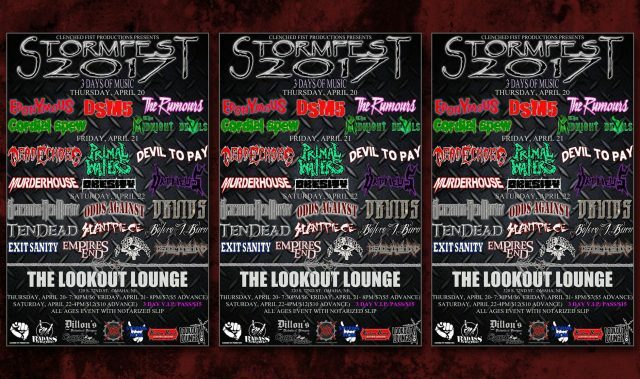 This year’s StormFest 2017 will feature three days of live music. That’s right, make NO MISTAKE FOLKS, three days of live music. It all starts April 20th, 2017, on a Thursday night in Omaha, Nebraska, at The Lookout Lounge. Thursday night will feature five bands total, DSM5, Cordial Spew, Hand Painted Police Car, The Midnight Devils, and The Rumours. Come Friday night, April 21st, 2017, it’s time to get heavy. Friday night features a lineup that is no stranger to StormFest. Headlining Friday night is the all-mighty DeadEchoes. The lineup is full of great acts including Cynge, Primal Waters, Obesity, Bloodrail, and Orpheus. This is sure to be super f#$%ing killer! Finally, when you wake up Saturday morning and feel totally shot, it’s time to pour yourself a glass of get-your-mofo’n-self-together-coffee and finish this weekend out right. Saturday, April 22nd, 2017, is packed with ten bands! You heard right, ten bands. Headlining Saturday night is Screaming Red Mutiny from Tulsa, OK. Going down the list we have TenDead, Exit Sanity, Odds Against, Slantpiece, Empires End, Dbuids, Before I Burn, In The Attack, and 9ine Foot Squirrel. I personally cannot wait to see TenDead. TenDead is Omaha’s doom machine that is straight outta hell. You’re going to love the heavy grooves and powerful riffs that knock your equipment in the dirt! So there you have it, Thursday, April 20th, Friday, April 21st, and Saturday, April 22nd… mark your damn calendars, book your hotels, sleep in your car, bathe in a river… do whatever it takes to make this years party of all parties. StormFest 2017 is an all-ages event with notarized slip. For more information on the notarized slip, click here. Complete 3 day V.I.P. passes are only $15. You can purchase them via Facebook at Clenched Fist Productions. – News Beast out… insert drop the mic here! 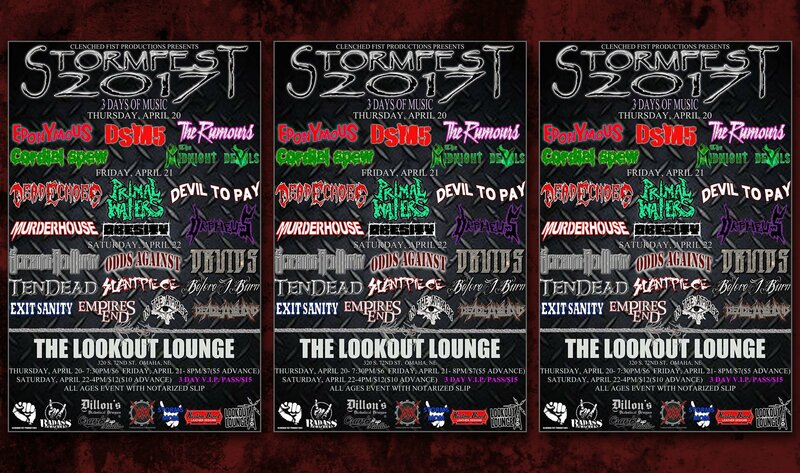 Previous articleTwo day StormFest 2017 Festival is already booked!